If you are in need of a south loop emergency dentist, call our office now at (312) 435-0411. If your emergency is life threatening, call 911 immediately. We offer after hours and weekend care for existing patients. At Printers Row Dental Studio, we are devoted to providing you with high-quality personalized dental care. We always do our best to see you on the same day that you call for an emergency dental treatment to ensure that you get the relief that you deserve. If you are experiencing a toothache or any severe pain in your mouth, visit us as soon as possible. The only way to cure a toothache is to treat its cause. Dr. Ema will quickly and effectively examine you to ensure that the cause of your severe pain is treated. Use ice and an over-the-counter pain medicine like acetaminophen to ease the pain until you can see Dr. Ema. 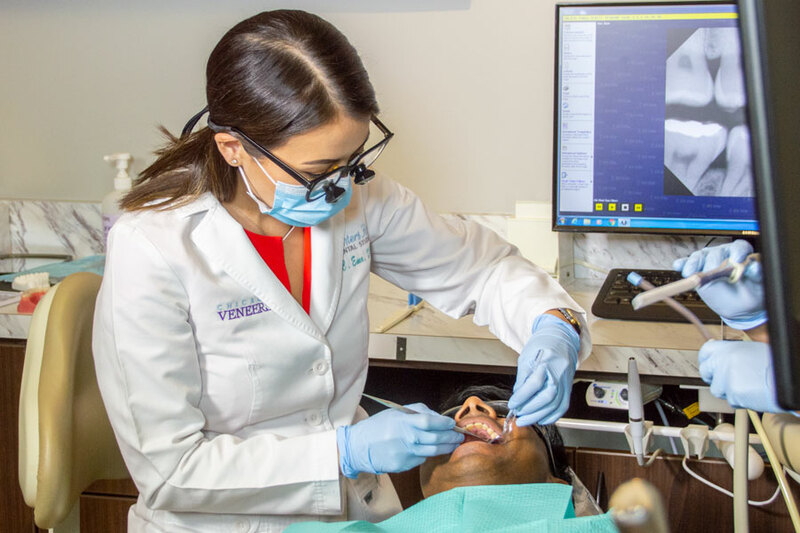 If you have a chipped or broken tooth, see Dr. Ema at Printers Row Dental Studio immediately–it may be possible to reattach the chipped portion of your tooth. Rinse your mouth with salt water to clean the area and try to stop the bleeding by applying pressure. If you can find the part of your tooth that has chipped, be sure to bring it with you. Remember: If the bleeding does not stop, go to the emergency room. If you have lost a tooth or if it has been knocked out, see your dentist as soon as possible. It may be possible to replant the tooth into your jaw if you are able to see your dentist within 1-2 hours. If you still have the tooth, handle it gently. Put the tooth in a glass of milk or in your own saliva and bring it with you. Rinse your mouth with salt water to clean it and try to stop the bleeding. You can learn more about caring for a lost tooth on Colgate’s website. If you have an abscessed tooth, see your dentist at Printers Row Dental Studio as soon as possible. If you are experiencing painful or swollen gums, your dentist will need to determine the underlying cause in order treat you effectively. An abscess is an infection of the gums or tooth root. If the abscess ruptures, you will experience a foul-smelling and foul-tasting pus from the area. Rinse your mouth with salt water if this happens. If you are experiencing a dental emergency, don’t hesitate to call us at (312) 435-0411! We’re here for you.